Speth’s confession for a spiritual transformation suggests that the Christian faith has an important contribution to alleviating ecological degradation. Most of humanity has forgotten that nothing in creation is owned – rather, it’s on loan to us from the One who created it all. Humanity stands at a very crucial point in our history. Instead of being distracted by the politics of the day, humanity needs a metanoia moment (Greek phrase meaning “to turn around”), which requires a change of the heart. We believe Christian hope can inspire this change. It is not a passive hope – waiting for external agencies to bring about what we desire; but rather an active hope – partnering with God to bring about transformation over despair. The Church of the Brethren has the opportunity to be partners with Jesus in living out his active hope to the world. 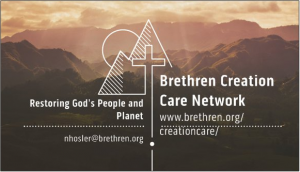 The Brethren Creation Care Network (BCCN) is our avenue towards a Christ-centered ministry for the healing of creation. We can rise to the challenge of creation care by building a community of support through your energy and talents. Please contact Nathan Hosler to join BCCN at nhosler@brethren.org. We would also like to highlight an upcoming retreat hosted at Camp Emmaus (Illinois). Outdoor Ministry Association Board members Jonathan Stauffer and Randall Westfall have come to believe that living attuned with God’s creation is essential to our discipleship with Jesus. In recent years, we have rediscovered just how attuned to creation Jesus was. He knew God’s wisdom came from these encounters and sought them out intentionally. He sought the solace of the wilderness, the sea, the mountain, and the garden to regenerate his ministry and mission. Jesus was drawing on a blueprint as old as creation itself. As a result, Jonathan and Randall have crafted an innovative weekend retreat entitled “Cultivating a Verdant Faith.” Sessions will be held March 8 – 10 at Camp Emmaus in the winter retreat lodge and on trails. By exploring the four directions of eco-discipleship, along with bible study, worship, and group discussions; participants will unearth their relationship with creation in new and profound ways. Ages 18 and up, are invited to unplug and rediscover the eco-blueprint of faith that our Creator gave us. If you’re interested in registering for this unique spiritual formation experience, please see this brochure. For further questions about the event contact Jonathan and Randall. CEUs will be available through Brethren Academy. (Note: Retreat limited to 25 participants.) They hope to see you at Camp Emmaus in March 2019!